Carnival Cruise Line has decided to name their second Vista-class ship Carnival Horizon. The 133,500-ton ship is currently under construction at Fincantieri's Marghera yard and is scheduled to be delivered in March 2018. Details appeared in the July 29 edition of Cruise News Daily. If you are dreaming of cruising down French waterways aboard Crystal river ships, those dreams may have to wait awhile. Crystal River Cruises has decided to delay their entry into the French river cruise market. Crystal said that based on customer feedback following the launch of their first ship, Crystal Mozart, on the Danube, they would increase their presence in the Germany and Austria regions by deploying all four of their new build river vessels over the next two years (2017-2018) on the Danube, Main and Rhine Rivers. The complete story appeared in the July 29 edition of Cruise News Daily. At an event in New York yesterday called a “Beer-B-Que,” Carnival introduced Guy Fieri's Pig & Anchor Bar-B-Que Smokehouse to New Yorkers - and announced its expansion to more ships. Details appeared in the July 28 edition of Cruise News Daily. Notice to all ports who are considering building cruise terminals and getting into the lucrative cruise business: If you build it, they won't necessarily come. Houston was in the cruise business for years, but only actually had ships sailing from their purpose-built, state-of-the-art cruise terminal seasonally for two years. Even then they had to offer them free rent, waived fees, and cash incentives to get them there. Genting Hong Kong's new Dream Cruise brand has scored a partnership with a familiar brand to Americans and Europeans, but for an unfamiliar strategy to them. Genting Dream will be Dream Cruises' first ship, entering service in October. The premium line will be marketing to Chinese and Asians. Genting Dream will also be the home of the first Johnnie Walker House at sea. Since Norwegian Cruise Line stating covering the hulls of their ships with distinctive artwork, the details of the design have been eagerly anticipated, especially in the home port of each new ship. The design usually has some connection to the home port or where the ship will sail, and the artist chosen to create the work has some connection to subject matter of the design. 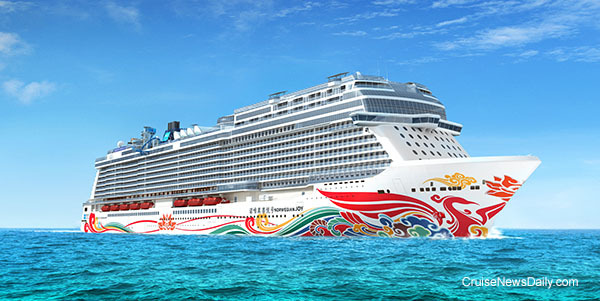 Today, Norwegian Cruise Line released details of Norwegian Joy's hull art, and as the first ship NCL will dedicate to the market in China, the hull art was deep in symbolism for China. 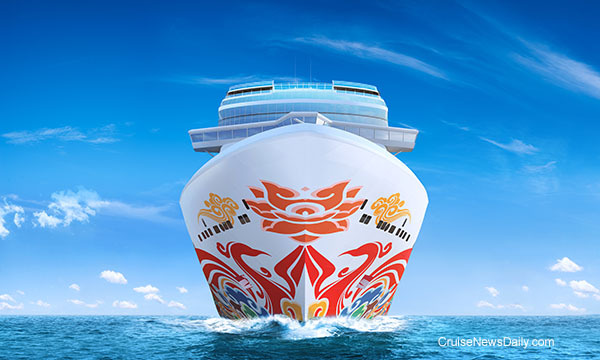 Norwegian Joy's hull art was commissioned from Chinese artist Tan Ping. Renderings are courtesy of Norwegian Cruise Line. All rights reserved. Many not be copied or used without express permission. Royal Caribbean has posted a spectacular video shot aboard Harmony of the Seas. Actually, it was shot from atop the giant ship, someplace you'd never normally go. The really cool part is that it was shot in 360-degree video, meaning you can put your mouse on the video and drag it around to see in any direction. Look to one side and you can see Marseilles (France). Drag the picture around (Careful! You're on top of the ship.) to look off the other side of the ship, and you'll see the Mediterranean. Look behind you (yes, you can look down too - if you dare), and you'll see the ship below you with all its features. You're going to need to play this several times to see everything. Princess is ready to bring one of their biggest ships into the Australian market for the first time. And the countdown is on for Emerald Princess' arrival for a five-month stay in the market. As things get more competitive, cruise lines are sending their most feature-rich ships to Australia, and Emerald Princess is decked out with Princess' latest features. To most of us, a pre-cruise package means a night or two in New York or Ft. Lauderdale, or maybe even a couple of nights someplace more exotic like Venice. But if your cruise is taking you someplace like along the coast of Antarctica, an even more unusual pre-cruise destination would be in order - like the South Pole. And that's exactly what Seabourn is offering. Celebrity's former Horizon, now Horizon operated by Royal Caribbean's French brand, Croisieres de France, ran aground this afternoon while departing Stavanger (Norway). Details appeared in the July 25 edition of Cruise News Daily. Two more lines are bypassing Turkish ports this week. Celebrity Cruises and Princess Cruises both canceled calls this week at several Turkish ports, and Princess extended the Istanbul ban through the end of the year.